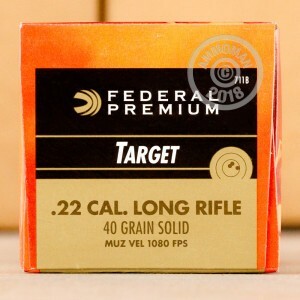 Competitive shooters will appreciate the accuracy and consistency of this .22 LR ammunition from Federal's Gold Medal series. 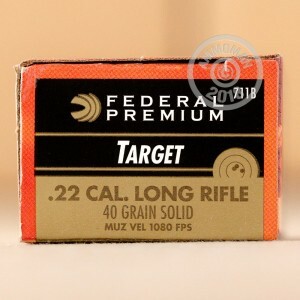 This match grade ammo costs a bit more than your average range fodder, but delivers considerably better overall performance. 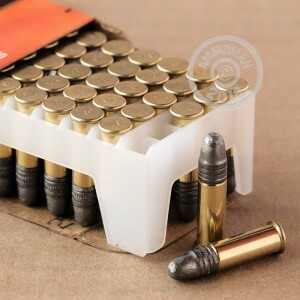 Each cartridge in this "brick" of 500 fires a 40 grain lead round nose bullet at a subsonic muzzle velocity of 1,080 feet per second. By avoiding the sound barrier, subsonic loads maintain excellent short-range accuracy; they also work well with suppressors to produce better noise reduction. Federal Gold Medal ammo is loaded in Anoka, Minnesota. 22LR can be rough. I wanted to try this and glad that I did. Very consistent. Out of the first 150 rounds I had no squibs. Fired through my Henry h001. Going to try them next in a marlin 60. Definitely worth the extra few dollars when I’m trying to have tight groups at 50 yards. ( iron sights). Will absolutely buy more.